CircleCi has given free tier for a while now. So I figured, since I'm using github for my blog content, I could use it's free continous integration & delivery service to publish my blog easily. I found a blog post that gives instruction to do that, but apparently it doesn't work. s3cmd couldn't get the access key ID and secret access key I set. Since CircleCi has awscli preinstalled, it's better to use that one instead. Pelican doesn't support awscli yet, so there's some steps need to be done to use that. Now, everytime you push your commits to master, CircleCI will deploy them to S3. You should be able to see the deployment progress on you CircleCI dashboard. You don't need to create special environment to install pelican etc, just git and text-editor. 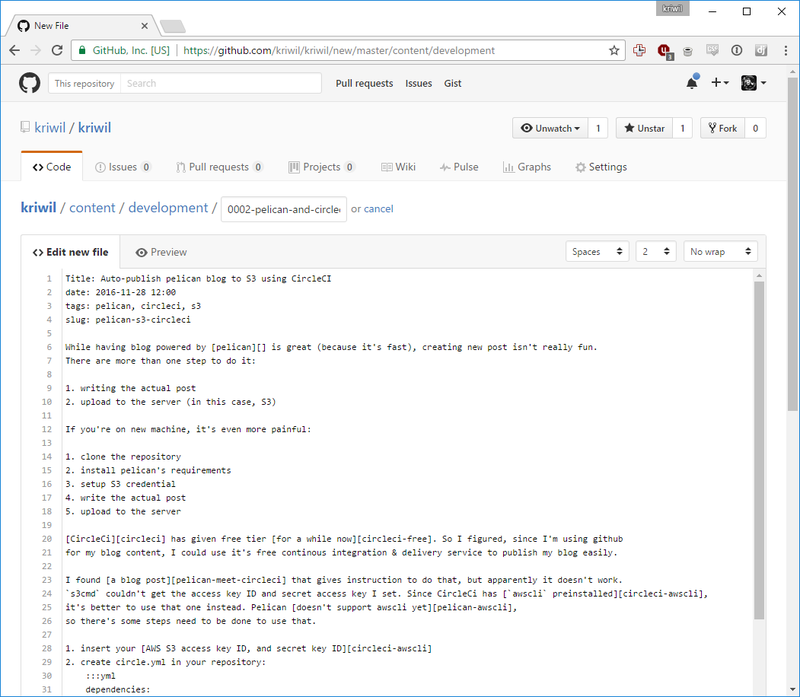 You could even use github's feature to create blog post directly inside your browser (I wrote this using that! ).